Falling Through The Cracks: A briefing on climate change, displacement and international governance frameworks: An overview of the legal and policy frameworks governing climate-induced displacement at the international level. 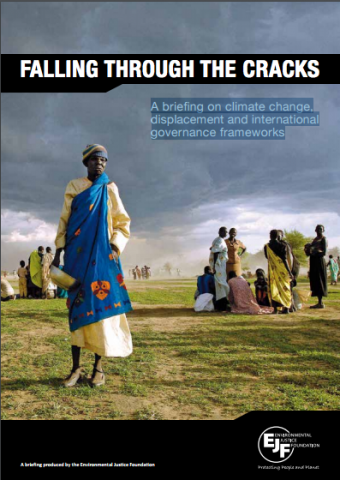 Falling Through The Cracks is intended as an overview of the legal and policy frameworks governing climate-induced displacement at the international level. It aims to inform policymakers and interested individuals about the range of relevant legal and policy instruments and to assess how effective these various options are at responding to the issue of climate-induced displacement. EJF's briefing highlights the lack of adequate legal and policy frameworks governing climate-induced displacement at the international level. It finds that the 'protection gap' is more like a series of holes, suggesting the need for a new global framework which is both broad in scope and sufficiently sensitive to the needs of multiple populations of concern. 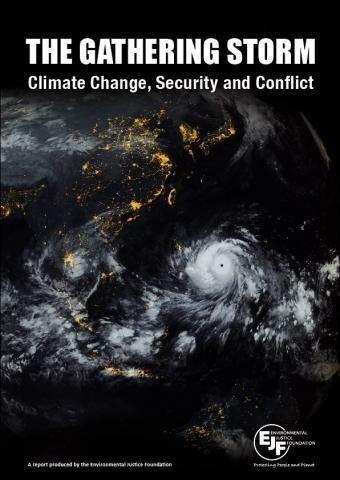 The Gathering Storm: Climate Change, Security and Conflict: The Gathering Storm: Climate Change, Security and Conflict collates evidence from around the world to show how climate change is acting as a catalyst for conflict and instability. It demonstrates how some of the most vulnerable people in the world are the first and worst affected by climate change, exposed to negative impacts which erode their human rights and place their homes, livelihoods and cultures at risk. The report analyses how climate change exacerbates resource competition and water scarcity, generates widespread displacement and risks overwhelming some of the world’s fragile and post-conflict states. It calls for climate change to be recognised as a human rights issue as well as an environmental issue and highlights the need for urgent international action to respond to the human and national security challenges that climate change presents. 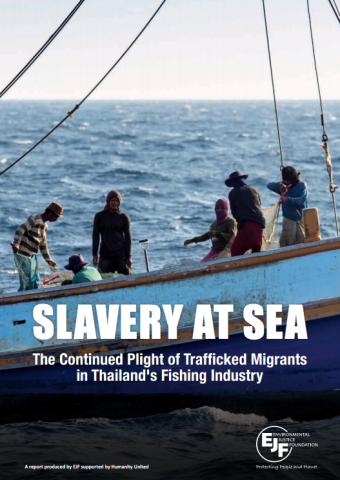 Slavery at Sea: The Continued Plight of Trafficked Migrants in Thailand's Fishing Industry: The report reveals new evidence of human trafficking and the use of violence in the Thai fishing industry. 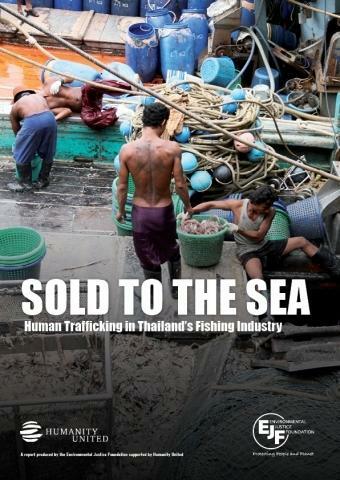 The report reveals new evidence of human trafficking and the use of violence in the Thai fishing industry and inaction on the part of the Government to identify and prosecute criminals, corrupt officials and unscrupulous business operators, or to enforce measures to regulate fishing fleets and recruitment practices. The report and film detail testimonies of the 14 men rescued from a port in Kantang - first reported in Sold to the Sea - one year since their rescue. They also document the story of a 21 year old individual from Myanmar who was trafficked and forced to work on a Thai fishing boat in March 2013, before eventually escaping in December after 10 months of unpaid work aboard the boat. 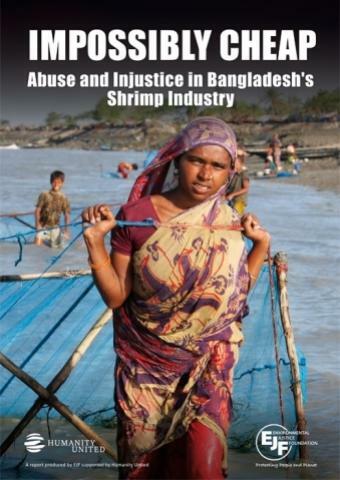 Impossibly Cheap: Abuse and Injustice in Bangladesh’s Shrimp Industry: The report documents examples of hazardous working conditions, the use of child labour, withholding of pay, health and safety violations, restricted union activities, verbal abuse and excessive hours. Featuring testimonies recorded during investigations in 2012, Impossibly Cheap: Abuse and Injustice in Bangladesh’s Shrimp Industry documents examples of hazardous working conditions, the use of child labour, bonded labour, withholding of pay, excessively low wages, health and safety violations, restricted union activities, verbal abuse and excessive hours. Impossibly Cheap: Abuse and Injustice in Bangladesh’s Shrimp Industry follows EJF's The Hidden Cost report, published in September 2013, which documents accounts of human trafficking into the Thai shrimp industry, confiscation of identification documents, withholding of pay, forced detention and bonded labour. The Hidden Cost: Human Rights Abuses in Thailand's Shrimp Industry: The report documents accounts of human trafficking into the Thai shrimp industry, confiscation of identification documents, withholding of pay, forced detention and bonded labour. The report exposes the reliance of Thailand’s shrimp industry on migrant workers, many of whom are trafficked and face arduous journeys, and even armed robbery, before enduring abusive conditions in shrimp processing factories. During investigations carried out in October 2012 and March 2013, EJF gathered evidence of perilous human trafficking into Thailand, as well as serious labour and human rights violations in shrimp facilities. 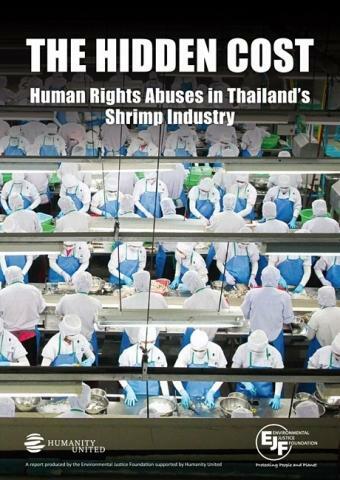 The Hidden Cost: Human Rights Abuses in Thailand’s Shrimp Industry follows EJF’s Sold to the Sea report, published in May this year, which revealed evidence of human trafficking, labour abuse and the routine use of violence, including murder, in the Thai fishing industry. 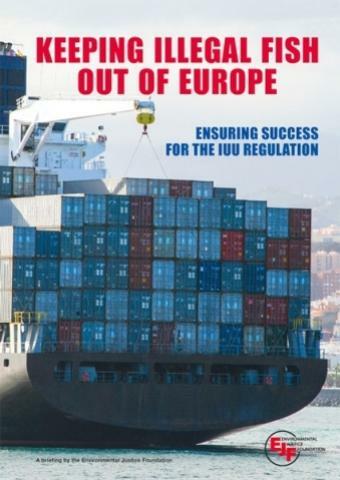 Keeping Illegal Fish out of Europe: Ensuring Success for the IUU Regulation: The IUU Regulation seeks to prevent illegally caught fish from reaching European markets. This innovative legal tool has placed the EU at the forefront of efforts to address pirate fishing. Whilst it has the potential to leave a positive legacy in the fight against IUU fishing, evidence demonstrates that a lack of coordination and uniformity in its implementation risks compromising its intended objectives. Diversions of fish consignments to Member State ports with poorer controls than those of their neighbours and a growing trend in containerisation of fish suggest a need for more consistent implementation efforts and increased trade flow scrutiny. The absence of any vessels in the IUU Vessel Community List identified independently by Member States or by the European Commission is also concerning. Sold to the Sea: Human Trafficking in Thailand's Fishing Industry: Sold to the Sea exposes human trafficking, labour and human rights abuses in Thailand's fishing industry. The report exposes severe human rights abuses associated with human trafficking in Thailand's fishing industry and documents the testimonies of Burmese workers, as young as 16, who were forced onto fishing vessels for many months and subjected to arduous, often violent, working conditions without pay. The report details testimonies of crew murdered at sea, and on shore, and the shocking figure from a 2009 survey by the United Nations Inter-Agency Project on Human Trafficking (UNIAP) that found 59% of interviewed migrants trafficked aboard Thai fishing boats reported witnessing the murder of a fellow worker. 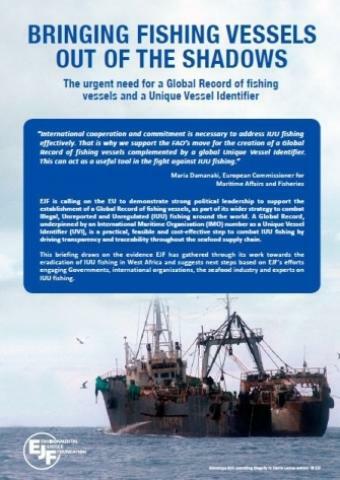 Bringing Fishing Vessels out of the Shadows: EJF is taking action to highlight the urgent need for a Global Record of fishing vessels and the use of the International Maritime Organisation (IMO) number as a Unique Vessel Identifier (UVI). Bringing fishing vessels out of the Shadows draws heavily on EJF’s work towards the eradication of Illegal, Unregulated and Unreported (IUU) fishing in West Africa, which has revealed a compelling need for an international database of industrial fishing vessels containing their UVI and information on their ownership, flag, history, characteristics and fishing authorisations. As explained by this briefing, EJF has documented vessels using multiple identities and changing their flags, names and radio call-signs to avoid detection and sanctions. A Global Record, alongside the obligatory use of a unique vessel identifier (UVI) in the form of an IMO number would drive transparency and traceability in global fisheries, thereby facilitating improved fisheries management and further action against IUU fishing. EJF is calling on the EU to demonstrate strong political leadership to support the establishment of a Global record of fishing vessels, as part of its wider strategy to combat IUU fishing.